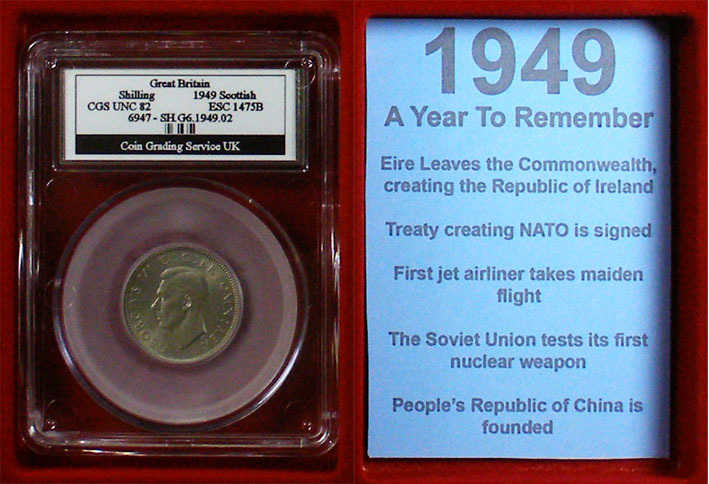 The year to remember set includes all the coins issued for general circulation for a given year say 1949 or 1988. The set is also customised to include the name of the recipient, the event commemorated for example birthday, and significant historical events that occurred in the year in question. 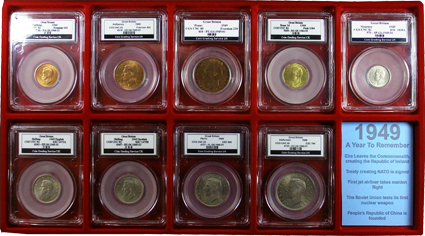 All the coins have been graded and encapsulated by CGS - UK making the set desirable as a collectors item also. Coins have a higher value the better condition (what coin collectors term grade) they are in and each of our sets will contain the highest grade coins we can source at the time. This makes the Year to Remember set a quality item with the individual coins having values of £15 upwards and the entire set usually in the region of £150 - £250. Each set comes in its own customised display glass covered case. Potentially all years are available but not off the shelf. We will quote a price for a given year, when this is accepted and a deposit paid we will then source the coins from the mainstream numismatic market, submit them to CGS - UK for grading and encapsulation, then supply the set. A delivery date of at least 6 weeks after order is recommended.